On an episode of the Late Show, host Stephen Colbert and Jane Lynch had an interesting discussion of guardian angels. 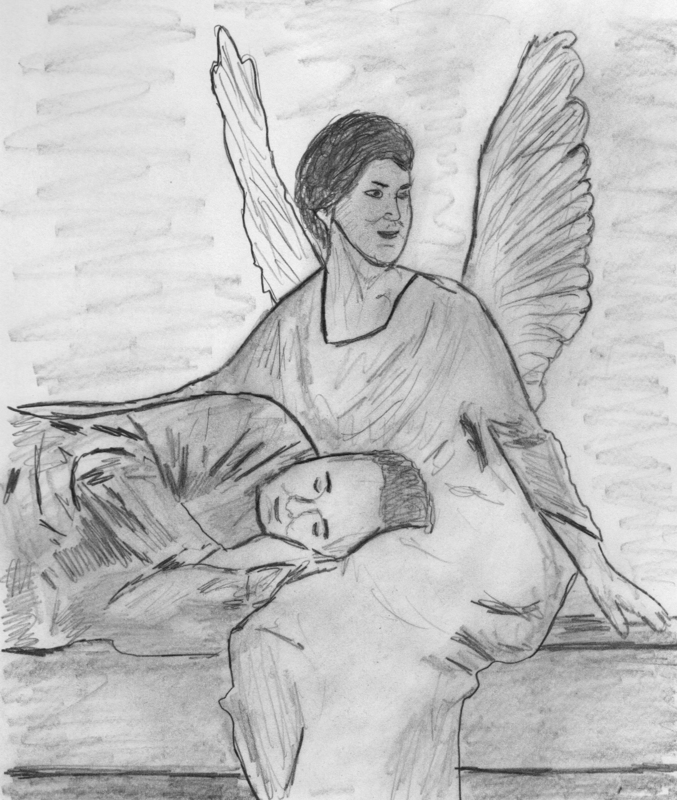 Lynch, who currently stars as a guardian angel in “Angel from Hell”, related a story of how her guardian angel held her in a protective embrace during a low point of her life. Colbert, ever the rational Catholic, noted that he believed in guardian angels despite knowing that they do not exist. The question of the existence of guardian angels is certainly an interesting one and provides yet another way to consider the classic problem of evil. In general terms, a guardian angel is a supernatural, benevolent being who serves as the personal protector of someone. The nature of their alleged guarding varies considerably. For some, the guardian angel is supposed to serve in the classic “angel on the shoulder” role and provide good advice. For others, the angel provides a comforting presence. Some even claim that guardian angels take a very active role, such as reducing a potentially fatal fall to one that merely inflicts massive bodily injury. My interest is, however, not with the specific functions of guardian angels, but with the question of their existence. In the context of monotheism, a guardian angel is an agent of God. As such, this ties them into the problem of evil. The general problem of evil is the challenge of reconciling the alleged existence of God with the existence of evil. Some take this problem to decisively show that God does not exist. Others contend that it shows that God is not how philosophers envision Him in the problem—that is, He is not omniscient, omnibenevolent or omnipotent. In the case of guardian angels, the challenge is to reconcile their alleged existence with evil. One merely has to look through the news of the day to see a multitude of cases in which a guardian angel could have saved the day with fairly little effort. For example, a guardian angel could inform the police about the location of a kidnapped child. As another example, a guardian angel could exert a bit of effort to keep a ladder from slipping. They could also do more difficult things, like preventing cancer from killing children or deflecting bullets away from school children. Since none of this ever seems to happen, one obvious conclusion is that there are no guardian angels. However, as with the main problem of evil, there are some ways to try to address this specific problem. One option, which is not available in the case of God, is to argue that guardian angels have very limited capabilities—that is, they are incredibly weak supernatural beings. Alternatively, they might operate under very restrictive rules in terms of what they are allowed to do. One problem with this reply is that such weak angels seem indistinguishable in their effects from non-existent angels. Another problem ties this into the broader problem of evil: why wouldn’t God deploy a better sort of guardian or give them broader rules to operate under? This, of course, just brings up the usual problem of evil. Another option is that not everyone gets an angel. Jane Lynch, for example, might get an angel that hugged her. Alan Kurdi, the young boy who drowned trying to flee Syria, did not get a guardian angel. While this would be an explanation of sorts, it still just pushes the problem back: why would God not provide everyone in need with a guardian? Mere humans are, of course, limited in their resources and abilities, so everyone cannot be protected all the time. However, God would not seem to suffer from such a limitation. It is also possible to make use of a stock reply to the problem of evil and bring in the Devil. Perhaps Lucifer deploys his demonic agents to counter the guardian angels. So, when something bad happens to a good person, it is because her guardian angel was outdone by a demon. While this has a certain appeal, it would require a world in which God and the Devil are closely matched so that the Devil can defy God and His angels. This, of course, just brings in the general problem of evil: unless one postulates two roughly equal deities, God is on the hook for the Devil and his demons. Or rather, God’s demons. As should be expected, guardian angels seem to fare no better than God in regards to the problem of evil. That said, the notion of benevolent, supernatural personal guardians predates monotheism. Socrates, for example, claimed to have a guardian who would warn him of bad choices (which Stephen Colbert also claims to have). These sort of guardians were not claimed to be agents of a perfect being, as such they do avoid the problem of evil. Supernatural beings that are freelancers or who serve a limited deity can reasonably be expected to be limited in their abilities and it would certainly make sense that not everyone would have a guardian. Conflict between opposing supernatural agencies also makes sense, since there is no postulation of a single supreme being. While these supernatural guardians do avoid the problem of evil, they run up against the problem of evidence: there does not appear to be adequate evidence for the existence of such supernatural beings. In fact, the alleged evidence for them is better explained by alternatives. For example, a little voice in one’s head is better explained in terms of the psychological rather than the supernatural (a benign mental condition rather than a supernatural guardian). As another example, a fall that merely badly injures a person rather than killing them is better explained in terms of the vagaries of chance than in terms of a conscious, supernatural intervention. Given the above discussion, there seems to be little reason to believe in the existence of guardian angels. The world would be rather different if they did exist, so clearly they do not. Or they do so little as to make no meaningful difference—which is rather hard to distinguish from not existing. I certainly do not begrudge people their belief in guardian angels—if that belief leads them to make better choices and feel safer in a dangerous world, then it is a benign belief. I certainly have comfort beliefs as well—as we all do. Perhaps these are our guardian angels. This, obviously, points to another discussion about such beliefs. During the Modern era, philosophers such as Descartes and Locke developed the notions of material substance and immaterial substance. Material substance, or matter, was primarily defined as being extended and spatially located. Descartes, and other thinkers, also took the view that material substance could not think. Immaterial substance was taken to lack extension and to not possess a spatial location. Most importantly, immaterial substance was regarded as having thought as its defining attribute. While these philosophers are long dead, the influence of their concepts lives on in philosophy and science. In philosophy, people still draw the classic distinction between dualists and materialists. A dualist holds that a living person consists of a material body and an immaterial mind. The materialist denies the existence of the immaterial mind and accepts only matter. There are also phenomenonalists who contend that all that exists is mental. Materialism of this sort is popular both in contemporary philosophy and science. Dualism is still popular with the general population in that many people believe in a non-material soul that is distinct from the body. Because of the history of dualism, free will is often linked to the immaterial mind. As such, it is no surprise that people who reject the immaterial mind engage in the following reasoning: an immaterial mind is necessary for free will. There is no immaterial mind. So, there is no free will. Looked at positively, materialists tend to regard their materialism as entailing a lack of free will. Thomas Hobbes, a materialist from the Modern era, accepted determinism as part of his materialism. Taking the materialist path, the argument against free will is that if the mind is material, then there is no free will. The mind is material, so there is no free will. Interestingly enough, those who accepted the immaterial mind tended to believe that only an immaterial substance could think—so they inferred the existence of such a mind on the grounds that they thought. Materialists most often accept the mind, but cast it in physical terms. That is, people do think and feel, they just do not do so via the mysterious quivering of immaterial ectoplasm. Some materialists go so far as to reject the mind—perhaps ending up in behaviorism or eliminative materialism. Julien La Metrie was one rather forward looking materialist. In 1747 he published his work Man the Machine. In this work he claims that philosophers should be like engineers who analyze the mind. Unlike many of the thinkers of his time, he seemed to understand the implications of mechanism, namely that it seemed to entail determinism and reductionism. A few centuries later, this sort of view is rather popular in the sciences and philosophy: since materialism is true and humans are biological mechanisms, there is no free will and the mind can be reduced (explained entirely in terms of) its physical operations (or functions). One interesting mistake that seems to drive this view is the often uncritical assumption that materialism entails the impossibility of free will. As noted above, this rests on the notion that free will requires an immaterial mind. This is, perhaps, because such a mind is said to be exempt from the laws that run the material universe. One part of the mistake is a failure to realize that being incorporeal is not a sufficient condition for free will. One of Hume’s many interesting insights was that if immaterial substance exists, then it would be like material substance. When discussing the possibility of immortality, he claims that nature uses substance like clay: shaping it into various forms, then reshaping the matter into new forms so that the same matter can successively make up the bodies of living creatures. By analogy, an immaterial substance could successively make up the minds of living creatures—the substance would not be created or destroyed, it would merely change form. If his reasoning holds, it would seem that if material substance is not free, then immaterial substance would also not be free. Leibniz, who believed that reality was entirely mental (composed of monads) accepted a form of determinism. This determinism, though it has some problems, seems entirely consistent with his immaterialism (that everything is mental). This should hardly be surprising, since being immaterial does not entail that something has free will—the two are rather distinct attributes. Another part of the mistake is the uncritical assumption that materialism entails a lack of freedom. Naturally, if matter is defined as being deterministic and lacking in freedom, then materialism would (by begging the question) entail a lack of freedom. Likewise, if matter is defined (as many thinkers did) as being incapable of thought, then it would follow (by begging the question) that no material being could think. Just as it should not be assumed that matter cannot think, it should also not be assumed that a material being must lack free will. Looked at another way, it should not be assumed that being incorporeal is a necessary condition for free will. What, obviously enough, seems to have driven the error is the conflation of the incorporeal with freedom and the material with determinism (or lack of freedom). Behind this is, also obviously enough, the assumption that the incorporeal is exempt from the laws that impose harsh determinism on matter. But, if it is accepted that a purely material being can think (thus denying the assumption that only the immaterial can think) it would seem to be acceptable to consider that such a being could also be free (thus denying the assumption that only the immaterial can be free). One classic philosophical dispute is the battle over innate ideas. An innate idea, as the name suggests, is an idea that is not acquired by experience but is “built into” the mind. As might be imagined, the specific nature and content of such ideas vary considerably among the philosophers who accept them. Leibniz, for example, takes God to be the author of the innate ideas that exist within the monads. Other thinkers, for example, accept that humans have an innate concept of beauty that is the product of evolution. Over the centuries, philosophers have advanced various arguments for (and against) innate ideas. For example, some take Plato’s Meno as a rather early argument for innate ideas. In the Meno, Socrates claims to show that Meno’s servant knows geometry, despite the (alleged) fact that the servant never learned geometry. Other philosophers have argued that there must be innate ideas in order for the mind to “process” information coming in from the senses. To use a modern analogy, just as a smart phone needs software to make the camera function, the brain would need to have built in ideas in order to process the sensory data coming in via the optic nerve. Other philosophers, such as John Locke, have been rather critical of the idea of innate ideas in general. Others have been critical of specific forms of innate ideas—the idea that God is the cause of innate ideas is, as might be suspected, not very popular among philosophers today. Interestingly enough, there is some contemporary evidence for innate ideas. In his August 2014 Scientific American article “Accidental Genius”, Darold A. Treffert advances what can be seen as a 21st century version of the Meno. Investigating the matter of “accidental geniuses” (people who become savants as the result of an accident, such as a brain injury), researchers found that they could create “instant savants” by the use using brain stimulation. These instant savants were able to solve a mathematical puzzle that they could not solve without the stimulation. Treffert asserts that this ability to solve the puzzle was due to the fact that they “’know things’ innately they were never taught.” To provide additional support for his claim, Treffert gave the example of a savant sculptor, Clemons, who “had no formal training in art but knew instinctively how to produce an armature, the frame for the sculpture, to enable his pieces to show horse in motion.” Treffert goes on to explicitly reject the “blank slate” notion (which was made famous by John Locke) in favor of the notion that the “brain might come loaded with a set of innate predispositions for processing what it sees or for understanding the ‘rules’ of music art or mathematics.” While this explanation is certainly appealing, it is well worth considering alternative explanations. One stock objection to this sort of argument is the same sort of argument used against claims about past life experiences. When it is claimed that a person had a past life on the basis that the person knows about things she would not normally know, the easy and obvious reply is that the person learned about these things through perfectly mundane means. In the case of alleged innate ideas, the easy and obvious reply is that the person gained the knowledge through experience. This is not to claim that the person in question is engaged in deception—she might not recall the experience that provided the knowledge. For example, the instant savants who solved the puzzle probably had previous puzzle experience and the sculptor might have seen armatures in the past. Another objection is that an idea might appear to be innate but might actually be a new idea that did not originate directly from a specific experience. To use a concrete example, consider a person who developed a genius for sculpture after a head injury. The person might have an innate idea that allowed him to produce the armature. An alternative explanation is that the person faced the problem regarding his sculpture and developed a solution. The solution turned out to be an armature, because that is what would solve the problem. To use an analogy, someone faced with the problem of driving in a nail might make a hammer but this does not entail that the idea of a hammer is innate. Rather, a hammer like device is what would work in that situation and hence it is what a person would tend to make. As has always been the case in the debate over innate ideas, the key question is whether the phenomena in question can be explained best by innate ideas or without them.